Ground Floor Unit - Perfect for families! This ground floor unit is a luxuriously appointed fully remodeled oceanfront property and is only one of two ground floor, one bedroom units that are available for rent and located on the sought after ocean side of the breezeway. 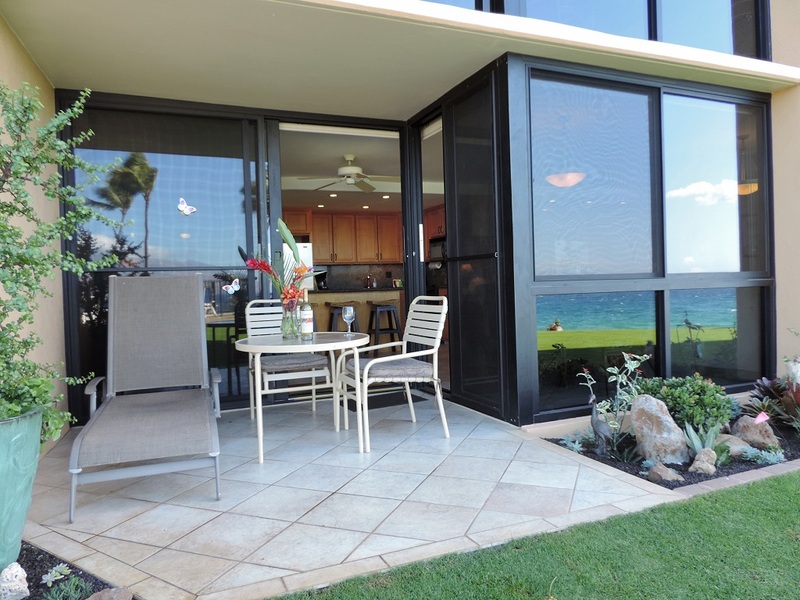 It is a one bedroom, one and a half bathroom unit (680 sq ft) that has spectacular ocean views from the living room, dining, kitchen, and lanai. The unit is tiled throughout. 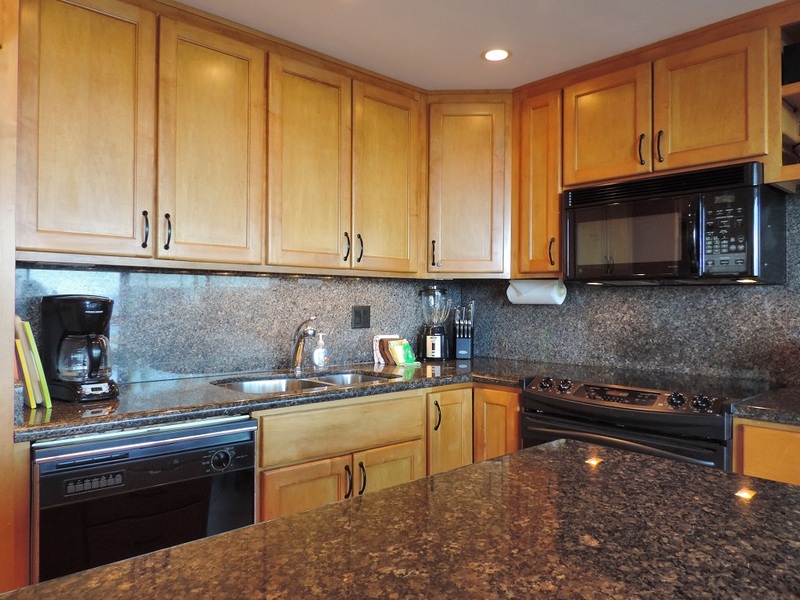 It has been tastefully remodeled to a very high rental standard and is very well maintained by its long term owners who frequent the property. The kitchen has an island configuration and granite counter tops, high end appliances; flat top stove, fridge with water and ice maker, dishwasher multi-function microwave oven, garbage disposer and a variety of small appliances including coffee maker, coffee grinder, four slice toaster, blender, crock pot, rice maker and hand mixer and is fully equipped with everything you will need to enjoy your vacation. There is also a large selection of higher end pots and pans, baking pans, kitchen knives, BBQ tools and ample matching dishes, glasses and cutlery. The living room has a queen sized sofa-bed, a 46" flat screen LCD-HD TV, HD cable box, DVD player, CD player and tropical themed multi-speed ceiling fan. There is also a built in desk with free wireless and Ethernet wi-fi, and free long distance calls to the USA and Canada. The dining area has a round rattan glass table with 4 matching tropical armchairs. The private oversized lanai has a chaise lounge and patio table with two armchairs; a perfect place to enjoy your morning coffee, sunset cocktails or a romantic oceanfront dinner! Turtles and dolphins can be seen year round, whales in season. The entry hall is very spacious, with a large dresser. The bedroom has a high quality pillow top queen size bed, Hawaiian style furniture, multi-speed ceiling fan and plantation shutters. There is also a digital security safe. The master bathroom has a marble counter top with matching full sized walk-in shower with bench and rain head. The half bath is also nicely appointed. Both bathrooms have Kohler elongated toilets. This condo is fully equipped with fresh linens and towels, hair dryer, iron/ironing board, beach chairs, beach towels and a cooler. Umbrellas, boogie boards and snorkel gear are not supplied, but are often left behind in the units by other guests – no guarantees. 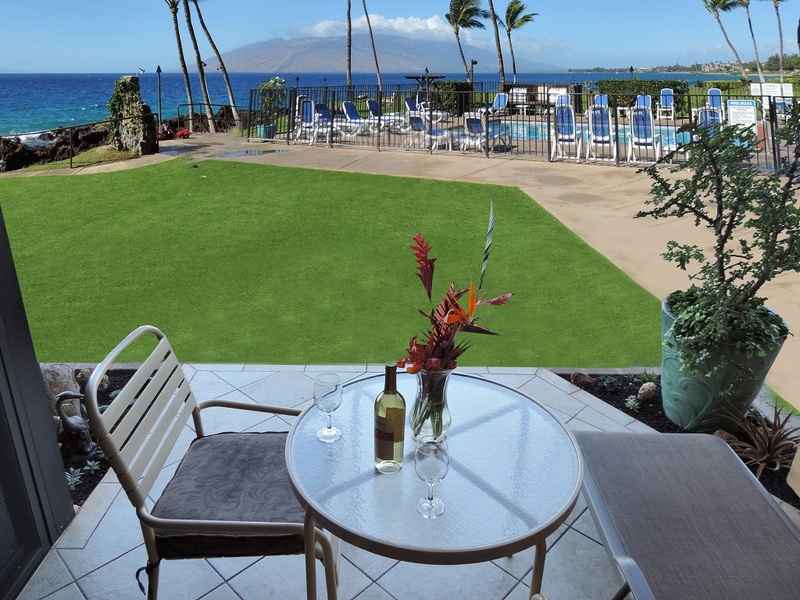 This unit is an excellent choice for couples or active families looking for a clean, comfortable high end oceanfront condo with a spectacular and absolutely unobstructed direct view of the Pacific Ocean and the West Maui mountains and very convenient access to the pool, barbeque area and adjacent 2 acre grass area. 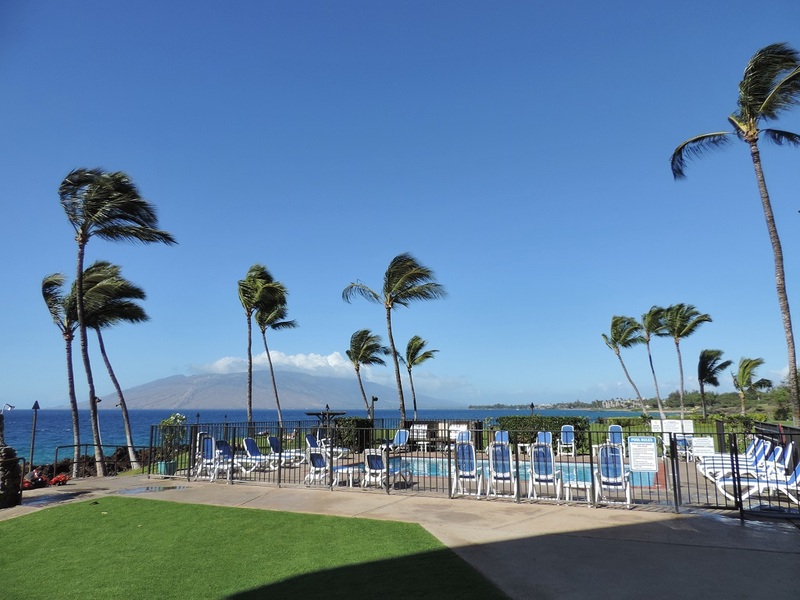 The Kihei Surfside building is located on the southern end of Kihei near Wailea, right at the north end of Keawakapu Beach, which in addition to being great for walking, sunning, swimming, snorkeling and boogie boarding, is one of the finest white sand beaches you will find anywhere.